Article first published as Blu-ray Review: Lee Chang-dong's Secret Sunshine and Poetry on Blogcritics. With his two latest films, Korean filmmaker Lee Chang-dong has established himself as one of the premiere figures in contemporary art house cinema. Now, American audiences have an excellent opportunity to catch up with both, which are making their U.S. Blu-ray debuts this week. Criterion is releasing Lee’s 2007 film, Secret Sunshine, which tells the story of Shin-ae (Jeon Do-yeon), a grieving woman dealing with the recent death of her husband. She moves from Seoul to her husband’s hometown of Miryang (which translates as secret sunshine) with her young son Jun (Seon Jung-Yeob). She’s in a daze, but she proves quite adept at putting on a happy face as she establishes a piano school, makes plans to buy a piece of development property and gently rebuffs the advances of genial mechanic Jong-chan (Song Kang-ho). But just when it appears she may have a handle on her own grief, another tragedy strikes, and waves of pain are dredged up all over again. Shin-ae eventually finds comfort in religion and asserts another level of control over her emotions, but that is fleeting too in its own way. Secret Sunshine has the potential to emotionally wreck anyone who sees it, and that makes it all the more remarkable how controlled the film plays. Lee has a firm handle on the proceedings, not allowing for any moments that feel extraneous, even though it runs for nearly two and a half hours and has a very measured pace. It’s a film that’s both narratively and emotionally complex without making a big deal of either — Lee’s matter-of-factness is backed up by his penetrating characterizations and simple, yet evocative photography. At the center of the film is Cannes best actress winner Jeon, who is a wonder. The physicality of the role is incredible — again, not in big, showy moments; just enormously moving quieter ones — and even as her character undergoes massive emotional transformations before our eyes, she never strays into histrionics. She’s impossible to take your eyes off of; so much so that it could escape you just how impressive Lee’s subtle narrative shifts are. Kino presents a release of Lee’s latest feature, 2010’s Poetry, and this one also features a nearly all-encompassing female performance at its center. 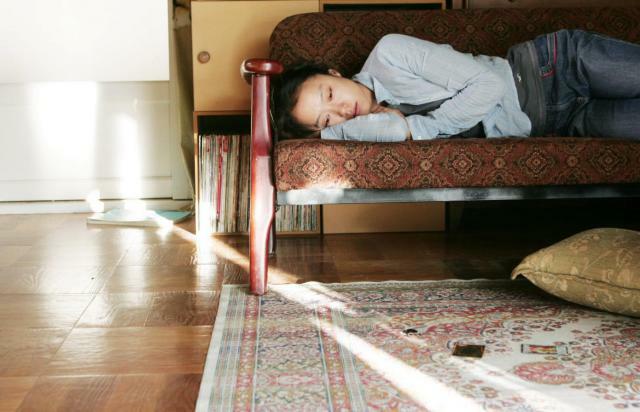 Hugely popular Korean actress Yun Jung-hee stars as Mija, a woman beginning to slip into the throes of Alzheimer’s. To combat the deterioration of her mind, she joins a poetry class while maintaining a part-time cleaning job for an elderly invalid and taking care of her sullen high schooler grandson. Like in Secret Sunshine, a heinous tragedy invades Mija’s life, although in a more indirect way. She must deal with the repercussions of that incident as she attempts to see the world in a different way in order to write a poem. Poetry again showcases Lee’s extraordinary ability to craft quietly moving scenes populated with distinct, lifelike characters. Yun’s performance embraces the childlike wonder of her character, and by plunging her into a truly horrible situation, Lee creates a fascinating portrait of the human spirit. The sublime and the wretched exist side-by-side in Lee’s universes, and it makes for unforgettable filmmaking. Criterion presents Secret Sunshine in 1080p high definition with an aspect ratio of 2.35:1. Simply put, this is a flawless transfer, with impeccable color detail, unwavering clarity and a rich, deep film-like image. Lee’s palette is generally bright and fresh, and the piercing blue sky and the sun-kissed colors of nearly every frame look outstanding. Audio is presented in a 5.1 DTS-HD Master Audio track that’s fairly active in the surrounds, presenting a gentle sense of place amid the dialogue-heavy mix. Kino presents Poetry in 1080p high definition with an aspect ratio of 1.85:1. Also an excellent presentation, colors are slightly more subdued here, but fine detail, sharpness and clarity are just as strong. The film’s outdoor on-location settings are filled with natural beauty, and this transfer replicates that beauty very nicely. Audio is also presented in a 5.1 DTS-HD Master Audio track that features clean, clear front channel dialogue with subtle use of the surrounds. The Secret Sunshine disc features a new video interview with Lee that’s the best of any of the extras on these two releases. He talks of his desire to make films that illuminate the mundane details of life and also speaks of the film’s religious elements, although he doesn’t consider it a religious film. Also on the disc is a short behind-the-scenes featurette that shows production taking place along with brief interviews with lead actors Jeon and Song. The U.S. theatrical trailer rounds out the disc, with the package also including a booklet with an excellent essay by critic Dennis Lim. On the Poetry disc, we get a brief making-of, which includes interview segments with Yun. There’s also a very short interview with Ahn Nae-sang, who plays a rather small role in the film. Trailers for Poetry and other Kino releases are included, as is a gallery of stills from the film. Don’t make yourself choose between the two. Once you see one Lee film, you’ll be ready for more. Both releases come highly recommended.